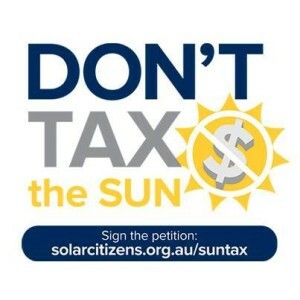 Solar Citizens has launched a petition to push back against a new proposal floated by the Australian Energy Market Commission to hit every solar home with a fee or tariff just to be connected to the grid. Tell our State Premiers and Energy Ministers that you won’t stand for a tax on the sun by signing the petition from our friends at Solar Citizens here: We're collecting signatures on this 'Don't Tax the Sun' petition and have over 26,000 so far. We're aiming for many more in time for when we present it to state and federal energy ministers. To help build awareness of this issue, and keep building the volume of solar owner voices around the nation.